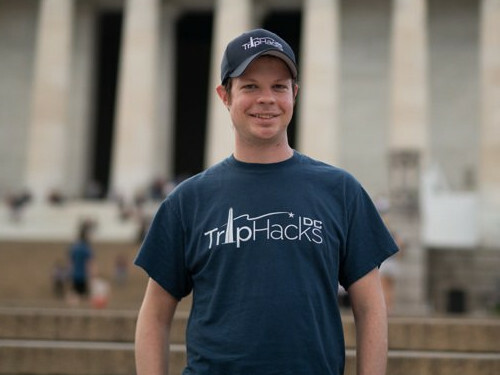 Want to personally tour the National Mall with Rob, founder of Trip Hacks DC? You’re in the right place! Rob is the host of the Trip Hacks DC YouTube channel and podcast as well as a tour guide with over a thousand hours of guiding experience. Rob loves showing off his city to visitors and specializes in small-group walking tours. He also leads some of the Monumental Trivia at Twilight public walking tours, but the best way to guarantee a tour with Rob is to book an exclusive private tour. What’s included on a private tour? How much does a private tour cost? Private tours are priced per group (up to 10) rather than per person. 3-hour tours cost $299 and 2-hour tours cost $199. If you’re more interested in a public tour, priced per person, check out our Monumental Trivia at Twilight tour, which Rob also leads once or twice per week. Whether you’re a solo traveler, couple, family or group of friends (up to 10 people) Rob can accommodate. On a private tour you won’t be placed on a tour with anyone else. The group sets the pace and you can ask as many questions that you want! Use the calendar tool below to see Rob’s private tour availability (his schedule is currently open through June 2, 2019). Please understand that Rob is a sought-after tour guide and during the busy spring and summer tour season his calendar books up quickly. If you don’t see the date that you want on the calendar please contact us and we’ll see if one of our other guides is available or if there’s something else what we can do. Once you select the date that you want on the calendar, use the “rate” dropdown box to see if there are multiple tours offered on that date. Fill out the registration, enter your payment details, and book your tour.